HEARsmart exists to look out for the hearing health of young Australians, preventing noise-induced tinnitus and hearing loss. According to stats from the World Health Organisation (WHO), 360 million people worldwide have hearing loss, making it the most common global sensory disability. They also reported that some 1.1 billion young people are increasing their individual risk of developing hearing loss through their listening habits. We’re totally on board with the WHO’s campaign “Make Listening Safe” that was launched to raise awareness of these risk; we know that individuals can avoid tinnitus and hearing loss by adopting healthier hearing habits, such as reducing exposure to excessive loud sound – a major cause of acquired permanent hearing loss and tinnitus worldwide. 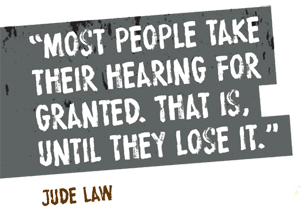 Research has shown that one in six Australians suffer some form of hearing loss. Tinnitus is also common – most people report that they experience ‘ringing in the ears’ every now and then, usually after they’ve been exposed to loud sound, but for around 10% of the population, it’s a permanent condition that can have debilitating effects. We know that tinnitus an early indicator of hearing damage and its prevalence is rising in young people. A significant proportion of both of these conditions is caused by cumulative exposure to loud sound. Of course, sound is present in all aspects of life. At work, noise exposure it is regulated by law, but recreational sound is largely unregulated, which means that many people could be over-exposed without knowing it. Our investigations into recreational sound have revealed some interesting trends; the highest risk groups are those who spend time clubbing, attending live music gigs and playing in bands. Based on these findings, we created HEARsmart to promote hearing health and reduce noise-induced tinnitus and hearing loss in the community, with a strong focus on young people – in particular musicians and music patrons. As a natural home for music, live venues are also of interest to us at HEARsmart, as well as the bodies that influence and govern them. The HEARsmart team is actively researching in this area and we are using our findings to focus HEARsmart activities and messages. There is a diverse range of organisations working in this space, many sharing our common interest in promoting hearing health and reducing noise-induced tinnitus and hearing loss. HEARsmart has aligned itself with these organisations and we are actively working together to positively to get our message out to those who need to hear it most. Check out the about section of this site if you want to know more about who we are.